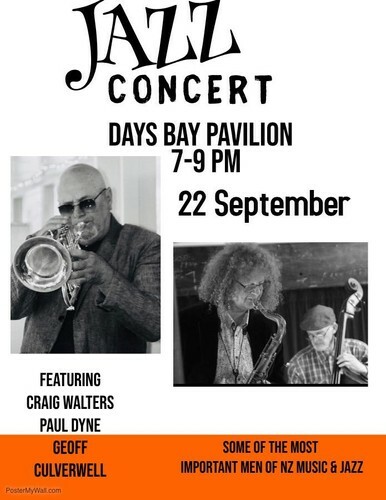 Jazz is back at the “Pavilion” in stunning Days bay, just a stones throw from Wellington CBD Sept 22nd. This one and only Wellington area concert features the group VSOP (Geoff Culverwell vsop TV1 youtube link) this time with special guest Craig Walters “a recent tenor sax fugitive” from the Australia session and jazz scene in Sydney is visiting NZ, he has massive international creds and is coming to blow the house down! This is an important group of master musicians and educators that have shaped the NZ jazz and music scene for decades. This one could be standing room only, reserve a table soon. Great venue, easy parking, great menu.